Gdansk passenger and car ferry ticket prices, timetables, ticket reservations and information for ferries sailing from Gdansk to Nynäshamn. Compare all available Gdansk ferry ticket prices in real time and book the cheapest available Gdansk car and passenger ferry tickets sailing to and from Gdansk, Nynäshamn with Polferries ferries online with instant confirmation. Book Gdansk Ferry Tickets with Polferries for ferries sailing from Gdansk to Nynäshamn online in advance to enjoy the cheapest available ferry ticket price. The price you see is the price you pay. There are no hidden extras or surprises such as added fuel surcharges or booking fees and we do not charge you anything extra for paying with a Visa Electron card. The price we quote you for your selected Gdansk passenger or car ferry ticket, onboard accommodation and vehicle type is all you will pay, and that's a promise. To obtain a Gdansk ferry ticket price and book your ferry ticket securely online please use the real time ferry booking form on the left. You are also able to add a hotel at your destination, or anywhere else, to your ferry ticket when completing your ferry ticket reservation. Gdansk, situated on the coast of the Baltic Sea, is the capital city of Pomeranian Voivodship. Together with two other cities, Sopot and Gdynia, it forms a conurbation known as the Tricity with a total population of 750,000 (Gdansk itself has 456,000 inhabitants). While Gdynia serves mainly as a port and Sopot as a seaside resort, Gdansk is popular among visitors with its thousand-year history and impressive architecture. Gdansk Old Town attracts almost as many people as that of Krakow or Warsaw. In the past the city enjoyed a high degree of autonomy, which together with its participation in Hanseatic League, led to great prosperity. During its Golden Age, the turnover of Gdansk was bigger than that of London's East India Company. Later periods in Gdansk’s history were complicated and sometimes even dramatic. There’s a special atmosphere about Gdańsk, a unique look and feel that’s very different from that of other Polish cities. It could be something to do with its historic role as a port city, visited by and fought over by people from diverse nations. It’s definitely connected to its distinctive architecture, which is strongly influenced by its historic maritime connections. And the knowledge that its stunning centre was rebuilt from rubble after the devastation of WWII is breathtaking and inspiring. Whatever the source of its appeal, visitors are always delighted by the grand, ele­gant buildings of the Main Town district, and charmed by its decorative narrow side streets with their cafés and amber shops. Popular maritime pleasures include cruising downriver on a pleasure boat, or sipping a beverage at a dockside beer garden while admiring the mix of medieval and Renaissance rooftops on the skyline. Though it’s an old city with a tumultuous past, and the historic scars to prove it, 21st-century Gdańsk is a vibrant destination packed with diverse sights and entertainment options, and also makes a great base for journeys into the surrounding countryside. Stena Line operates ferry service between Gdynia and Karlskrona, Sweden. The trip takes 12.5 hours. 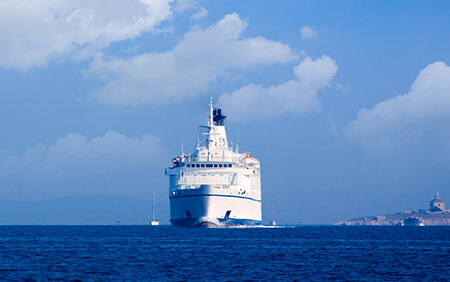 Finnlines operates ferry service between Gdynia and Helsinki, Finland. The trip takes 21 hours. The Old Town of Gdansk has been thoroughly restored after the destruction caused by World War II, leaving it once more with a beautiful city centre to wander around. The streets of Ulica Dluga and Dlugi Targ are among the best for appreciating cultural heritage. The pedestrianised area around these streets is packed with fine architecture and significant old structures. Top sights to cover on a tour include the Golden Gate, the Town Hall and Artus Court. While walking through the streets, you’ll see plenty of impressive red-brick churches, including the largest church in Poland - St Mary’s Church. On the waterfront you’ll also see the Gdansk Crane, built in the 15th century and at the time the largest in medieval in Europe (for loading and unloading the ships, of course). Across the river you can visit the Maritime Museum, featuring some interesting exhibits. You’ll also be able to board the Soldek cargo ship docked outside. More about the shipbuilding industry and more importantly the Solidarity movement that started the demise of Communism is featured in the very interesting Roads to Freedom exhibition, near the Gdansk shipyards. If you’re in Gdansk in summertime, hop on a train for a 20-minute ride to nearby Sopot, Poland’s favourite beach resort town. Alternatively, a number of “Pirate-style” boats leave from the waterfont in Gdansk on boat-trips around the area - an ideal way to spend a half a day. Best Price Guarantee - We always offer you our lowest available Polferries passenger and car ferries ticket price to and from Gdansk. There are no hidden extras or surprises such as added fuel surcharges or booking fees and we also we do not charge you anything extra for paying with a Visa Electron card. The price we quote for your selected Gdansk ferry ticket, onboard accommodation and vehicle type is all you will pay, and that's a promise! In the unlikely event you find the same all inclusive Gdansk ferry ticket cheaper in the brochure of any other tour operator we promise that we will do our best to beat that price or offer you the choice of requesting a refund. To book Gdansk car and passenger ferry tickets please click here. At ferryto.co.uk you are able to obtain live Gdansk ferry ticket prices, check availability and book car and passenger ferry tickets to and from Gdansk at our lowest available ticket price. Ferryto.co.uk is part of the world's largest online ferry ticket distribution network providing the ability to book over 80 major European ferry operators including to Gdansk and to over 1,200 other ferry routes throughout the UK, France, Spain, Ireland, Holland, Eastern Europe, the Mediterranean, the Baltic and North Africa.